In this recording, Robert Dilts takes you on a fascinating journey inside the mind of Wolfgang Amadeus Mozart, exploring his phenomenal strategy for composing music. Through an in-depth analysis of quotations and anecdotes, Robert paints a rich picture of Mozart's creative process. He then shows how Mozart's thinking process may be used by the listener to enhance his or her own creativity and problem-solving abilities. 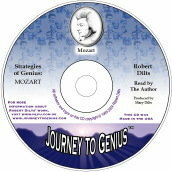 Part 1 of the audio CD explores the elements of Mozart's process for composing music, drawing inspiration from a letter written by Mozart about his music in 1789. At the core of this process is Mozart's powerful capacity for "synesthesia" - the ability to combine and intermix the senses. It is clear that many of Mozart's creative gifts came from his capacity to feel, see and even taste his music. The various stages of Mozart's composition strategy are "auditorily" illustrated by selections from his wonderful music. Part 2 of the CD summarizes the key phases of Mozart's composition strategy, comparing it with that of other famous composers (from Beethoven to Michael Jackson). At the conclusion of the CD, the information is synthesized into a guided meditation that takes the listener on a journey to explore his or her own inner creative world. This stimulating and enlightening journey into the creative process of one of history's greatest musical geniuses is one that you will enjoy over and over again.